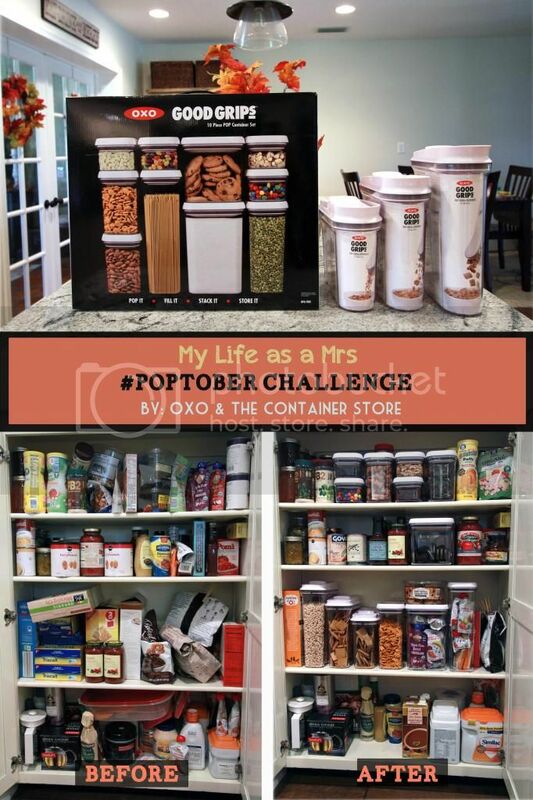 My Life as a Mrs. » OXO #POPtober Pantry Organization PLUS a Giveaway! I’m going to go ahead and let you in on my not so secret love for all things ORGANIZED. I say it all the time, but I don’t think you all realize how serious this obsession love is. Just ask my husband. I legit get excited to organize things (and find new ways and tools to do the organizing). I’ll be jumping up and down when he gets home to show off some storage bins I bought and how I used them to organize something (MEGA NERD ALERT, YA’LL!). He always makes fun of me… and I don’t even care. My old coworkers used to refer to me as OCDC. Then I noticed anytime they needed help figuring out how to create a system to organize something… I was their first call. Yep. I’m that girl. Queen Organization at your service! When given the opportunity to team up with OXO and The Container Store on this little challenge… I WAS BEYOND THRILLED. For starters, OXO is hands down one of my favorite brands… I’m seriously not just saying this. My home is FILLED with OXO products. Kitchen products and gadgets, bathroom/cleaning products, and of course most recently their baby products. I have to say, I haven’t met an OXO product that I haven’t loved. Seriously. Then if that wasn’t enough… the CONTAINER STORE too??!! Ya’ll. That store is an organizers paradise. An absolute dream. If you need something to help you organize anything in your kitchen, pantry, home, car (ANYWHERE)… they’ve got it all! This challenge was MADE for me. So off I went with my shiny new POP containers to reorganize my pantry (which was in desperate need of organizing). Ya’ll… organizing was an absolute BREEZE with these OXO POP containers. The POP lids make for easy one handed opening and closing (which helps this momma out tremendously!). Plus, the flat lids and square/rectangular shapes allow for stacking making them incredibly space efficient!! Now I just need to buy me another set so I can reorganize my baking pantry! Thankfully Christmas is coming and The Container Store has all the OXO POP Containers I could possibly want! Seriously check it out! I’ve even started a pinterest board for my wish list items! Follow My Life as a Mrs’s board OXO #POPtober Wish List on Pinterest. Now, I wouldn’t get you all excited about this without letting you know that you have an opportunity to WIN some of these organizational tools yourself! OXO is hosting a Facebook Giveaway (Enter tomorrow morning, October 13th through Friday, October 31st)! You can enter to win a prize pack worth $500, including your choice of OXO Storage & Organization tools (up to $250), as well as a $250 elfa gift card. That is one SWEET deal! What items would you pick if you won?! Disclaimer: I was not compensated for this post, however OXO kindly sent me this complementary set of POP containers. As always, the opinions of this product are my own! I don’t write about products or brands that I don’t truly love! I love just walking around the Container store and thinking about all of the things I could buy and what I could organize!! I love that set of containers. My problem would be: do I organize my pantry or give them to my daughter to set up her newly married self’s kitchen? Looks great! I find that when I have a clean pantry I have a clearer mind in the kitchen to concentrate on cooking! I really, love these, but to my comments won’t post! This is my third try! I would love to clean up my pantry with these! Or give them to my soon to be married daughter…! I continue to try and comment….my comments don’t post! I don’t know why! But…this would really be lovely in my pantry…or my daughter’s pantry as a wedding gift! I don’t knoe who’d appreciate this more…me or my soon to be married daughter! I’d love those containers so I could see what I have in the pantry!